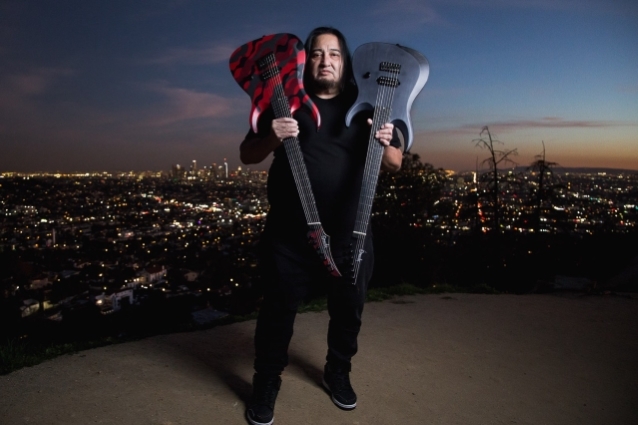 Share the post "DINO CAZARES Has No Information To Share About New FEAR FACTORY Album"
FEAR FACTORY guitarist Dino Cazares says that he has no information to share regarding a possible release for the band’s already-completed new album, tentatively titled “Monolith”. Cazares was asked about the status of FEAR FACTORY‘s first collection of new music since 2015’s “Genexus” LP during a brand new interview with “The Metal Command” radio show. Cazares also talked about FEAR FACTORY‘s musical evolution over the course of the group’s 30-year existence, particularly as it relates to the decade following the release of 1998’s “Obsolete” album, a period which saw Dino exit the band and focus on other projects while singer Burton C. Bell, drummer Raymond Herrera and bassist Christian Olde Wolbers carried on without him. “[1992’s] ‘Soul Of A New Machine’ and [1993’s] ‘Fear Is The Mindkiller’ [EP] and [1995’s] ‘Demanufacture’, there was only three of us — there was me, Raymond and Burt,” he said. “Me and Raymond wrote all the music. We were on the same page. We were like two peas in a pod. We were on the same level [in terms of] what we wanted to create. We didn’t wanna copy anything else, so we just exactly wanted to do our own thing, and we connected really well. So there was never that other outside writer coming in to bother us. We just did this, Burt would put his vocals on top, and it just worked perfectly. And then we had Rhys Fulber come in, do all the music. It wasn’t until ‘Obsolete’ where we got another bass player. We started letting the bass player write a little bit of the music, and some of his influences started to come in. Then when we got to ‘Digimortal’ , that bass player, that fourth wheel, he had more influence on what the record was gonna sound like. And I believe me and Raymond lost something there, because there was that other guy that you had to think about. “Some people may take what I’m saying bad, some people may take what I’m saying good, but sometimes when you have a good thing and you try to bring outside writers in — I wouldn’t say ‘outside writer,’ but another person to just write with you — sometimes things get lost. I believe that’s what happened during that period — from ‘Digimortal’ on,” he continued. The tentative title of FEAR FACTORY‘s new album was revealed by Bell during an interview with SiriusXM‘s Jose Mangin at last November’s inaugural Headbangers Con in Portland, Oregon. He also said that “legal technicalities” needed to be sorted out before the record could be released. In 2016, FEAR FACTORY completed a U.S. headlining tour on which it performed its classic second album, “Demanufacture”, in its entirety. FEAR FACTORY was the subject of breakup rumors in May 2017 when the band’s former bassist-turned-guitarist Christian Olde Wolbers posted a since-deleted eulogy for FF on his Instagram. He wrote “RIP Fear Factory” and appended that post with the hashtag #GrownAssMenThatCantWorkOutShit.